Aluminum has many qualities that should make it a suitable material for use in ultra-light and on-chip batteries: it has a high melting point, high conductivity, and low cost. Leite, a member of the Department of Materials Science and Engineering and the Institute for Research in Applied Physics is part of a team that created a new way to probe the degradation of an entire aluminum anode, in realtime and at nanoscale resolution, using a combination of electron microscopy techniques. What she and her colleagues discovered could give battery developers the insight they need for future success. All solid-state lithium-ion (Li-ion) batteries require anodes, positively charged electrodes that attract lithium ions during the charging process. These anodes have a “breathing” mechanism: their volume expands by the addition of lithium ions as the battery is being charged, a process called lithiation, then contracts as the ions diffuse back to the positive electrode during discharge, or delithiation process. The anodes must remain stable and able to withstand repeated cycles of charging and discharging without being pulverized in the process. Prior studies that attempted to explain aluminum anode failure suggested that they either crumbled, which has been observed in other anode materials, or that high strain caused the formation of a stiff aluminum-lithium alloy (AlLi) in the aluminum’s matrix, which ruined its ability to expand and contract properly. Leite and her colleagues devised a way to find out if either of these theories were correct. Using the new observation technique, Leite and her team discovered that aluminum anode failure is actually caused by lithium reacting with aluminum to form tiny "mounds" on the surface of the aluminum. These structures both permanently trap lithium and block still-free lithium ions from participating in the charge/discharge cycle. The anode’s surface compounded the problem. Without sufficient lithiation and delithiation, the battery’s performance is limited, and since lithium diffuses through aluminum very quickly at room temperature, it doesn’t take long for all these reactions to take place. Leite’s group is now exploring ways to address these problems, such as developing conductive thin films that will, when applied to surface of an aluminum anode, reduce oxidation and boost the battery’s capacity. The team also hopes to test their observation technique on other battery materials. 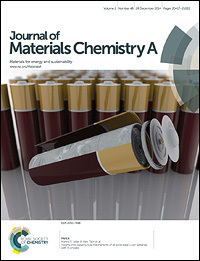 A paper describing the observation technique and results of the study was published in the Journal of Materials Chemistry A, where it was also featured on the publication’s inside cover.